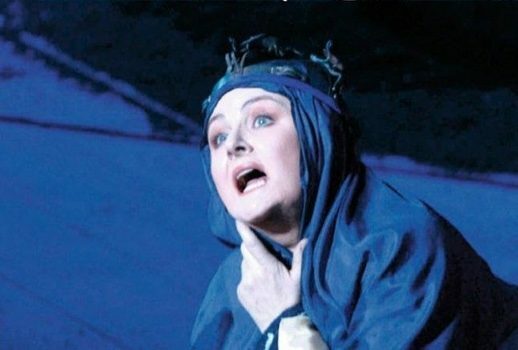 You may find this difficult to believe, but Bellini’s Norma didn’t initially make a significant impression on me back in the early 1980s when I first started listening to, and collecting complete operas on LP and later, video. The published listening guides I consulted, plus seasoned operagoers recommended Joan Sutherland and Maria Callas’s first complete recordings of the opera. Neither of them created any great reverence overall for the piece, save for a few isolated, truly memorable moments. I eventually wound up with nearly all of Sutherland’s documented assumptions of the role, the most by far I ever heard and saw from one soprano: I acquired her first and second complete recordings, two video performances, pirates of her debut in Vancouver, the Metropolitan and San Francisco broadcasts, one from Buenos Aires, another from Covent Garden, and a few other assorted pirates. Most importantly, I attended Sutherland’s very last run of Norma in Detroit, 1988. There is no doubt whatsoever that Sutherland, vocally and technically the most qualified, had the goods for the role; she could serve as a blueprint of the score’s requirement in this regard. Artistically and histrionically, though, I was never convinced. One can observe, in the existing video documents, and as I witnessed in Detroit, her efficient, committed application to the task, the sheer professionalism of her intents and purposes. But that is where it stopped. I never felt her truly immersed in the drama of Norma, never felt she had the ability to tap deeply into the multiple-varied emotional-musical aspects of the role. How does one, through writing, convey how you think an artist is lacking in getting into the internal conflicts of a role’s emotional and musical characterization? Sutherland’s Norma always sounded consistently well-coached, and the tone poured out effortlessly, fluently. I hear the following drawbacks: a monochromatic, opaque timbre in the middle and lower register, a lack of crisply differentiated vowel textures, an inability to draw a flexible, expressive, finely-tapered line, and a conspicuous insufficiency of insightful, dramatic impetus. As early as 1963, Sutherland began adopting a veiled, “mouthy” sound in place of the shining, silvery tone of her earliest recordings (her “Casta diva” always sounded like “Cuh-stuh dey-vuh”). You can hear, throughout all her years of singing Norma, learned emphases, and applied intent, but there’s little variety of tonal color; textual nuances are generalized, and crucial phrases often fail to register vividly or memorably. It’s a hazy blur of murky, overly-covered sounds, and this chronically undercuts any individuality of utterance in expression. There was magic in Sutherland’s Norma mainly when Marilyn Horne, bright of tone and brisk of manner, partnered her, and their duetting remains of a legendary caliber of singing. For many, though, Sutherland’s sheer ease in her vocalism is ample compensation. I didn’t find the magic in Callas’s Norma at first. That first studio recording, boxy and limited in its acoustic, caused Callas’s voice in the high-octane moments to sound harsh and strident. The Plain Jane, matronly Adalgisa of Ebe Stignani and the stentorian, hollered Pollione of Mario Filipeschi didn’t endear me to the set either. What stood immediately out, though, were those pliable, contoured, cantabile Bellinian lines that Callas mastered like they were written for her. It was not until much later, when I acquired Callas’s second commercial recording, as well as the live performances at Covent Garden 1952, and La Scala in 1955, that I began to realize her immense vocal and keen dramatic and musical instincts in the role. My favorite, though, remains her performance from Trieste in 1953; in that, Callas best and effectively balanced power along with delicacy—and vocally, it remains her finest, most secure assumption. She continues, despite her well-known vocal problems, so far, to reign supreme as Bellini’s priestess, firmly setting the precedent from the mid-20th century on. When I was entrusted in 2000 to do a survey review of all the complete commercial and a few live recordings of Norma for The Opera Quarterly, to commemorate the 200th anniversary of the birth of Vincenzo Bellini, I embarked on an intensive period of research. I pored through the Garland reprint of the autograph-manuscript score, the Dover partitura, the Ricordi and Boosey and Hawkes vocal scores, contemporary performance reviews and practices, reading and observing of cuts, editions, additions, restorations, transpositions taken, plus hundreds upon hundreds of hours of listening. It became the opera I studied the most, and, as a result, the opera, specifically the role, that became my favorite. It is the ultimate prima donna heroine. It was after doing this survey that I happened upon three remarkable, and revelatory performances: Beverly Sills from Boston, 1971; Montserrat Caballé in a film from Orange, France, 1974; and Renata Scotto in Houston in 1978. What’s telling is that all three of these live performances are far and away so much better than those they made in the studio. There’s no question that Sills’ flutey, floating, naturally soft, light tone was not, by nature, an ideal fit for the role. Her vocal production being laryngeal rather than resonance-based, she lacked tonal fullness, force and power for the role’s dramatic moments. However: Sills imbued a startling energy, concentration, and specificity of intent and purpose in aim of the drama’s meaning; and the alert, vivid recitatives, plus both the slow and fast melodies, were dispatched with skill and astonishing accuracy as far as the score was concerned, with a clear knowledge of the bel canto style. Legions of larger-voiced sopranos never even came close to how well Sills handled the legatos and coloraturas. Caballé, spurred out of her chronic laziness, gave one of her all-time best, committed, and most alertly sung performance of the role on that night in France. Though as usual she skimmed through the most exacting passagework, the delivery of the score’s most lyrical portions were sung with the plushest of tone of refulgent, unsurpassed beauty, breadth, and refinement. It was through Scotto, though, that I realized, by her birthright, timbre, and the size and weight of her tone, that she is probably closest to the type of voice that was heard in Bellini’s time. For one thing, no one else I heard ever sounded as impeccably right in the handling of the text as she did. The expression of the Italian language is born into and borne deep within her; she was not merely singing the words, but having an intimate familiarity with the architecture, rhythm, and coloration of them; her recitatives, in particular, flow with unusual naturalness. The brisk *metallo* of the vowels and consonants, the timbral clarity, the pungency of the lower reaches of the role—you can taste the red wine, garlic, and the hearty robustness of the country through her voice: and she is a ferociously gripping interpreter besides. The weight of the tone and the clarity of the timbre seem to be ideally aligned with the orchestral textures and the spare accompaniment in the purely lyrical sections; it sounds right in unison. That Scotto’s voice was not under full control at all times, nor exacting in her coloratura is beside the point; her Norma is essential for understanding the Italian operatic idiom. The following YouTube clip captures Scotto in another 1978 performance of this role, in Philadelphia. If you will notice the pattern of the singers I just outlined, is that they were all specialists in the realm of bel canto opera. Norma is one of the most badly miscast and mishandled roles in the operatic repertoire. The role is often sung by oversized, unruly, cumbersome, and blowsy voices with gunned vibratos and very little sense of the Bellinian idiom (how many sopranos have only one bel canto role—Norma—in their repertoire?). For these kind of voices one must be prepared for slovenly coloratura, hollered high notes, and treating the score like it is verismo-based. Bellini’s score, though of an expressively Romantic essence, often harkens back referentially, suggestively, to the Classical epoch. The orchestral textures are lean, diaphanous, and are awash in silver, tinged with gold tints; the vocal lines are long, elegiac, and sinuously elegant. an ability to imbue the role’s many varying emotions with color, variety, and skillful shading to be able to project a very personal, deep, internally-felt characterization for this most magnetic and multi-faceted of roles. Most of these requirements I find being met by Edita Gruberova in this assumption, caught right in the nick of time, and by my estimation her finest performance of the role in the 15 years she has been essaying it, caught at the Bavarian State Opera for DVD in January of 2006. Those who are used to a more robust, fuller tone will find Gruberova wanting. She will not have Callas’s spinto vocal quality, her unique coloration, nor the baleful, pungent chest tones; will not have Sutherland or Caballé’s fuller, larger voices, nor the more dramatic ones of others who may be preferred. Conditioned tastes, seasoned listeners with decades of adaptation to a particular voice type in a role are hard to get used to with one that is of an entirely different caliber. I know, because I could not, initially, in “my mind’s ear” imagine Gruberova in the role of Norma. Although I had found her assumptions of Elisabetta in Roberto Devereux and Anna Bolena to be of exceptional merit, somehow, Norma seemed like a role that was a more highly mythical, almost unattainable of a challenge because of the reputation that had preceded it. It really isn’t unattainable. It is actually easier in many ways than Elisabetta or Anna Bolena, for they have highly dramatic, demanding closing scenes, whereas Norma’s is more lyrical, less taxing vocally and technically (and I have noted that in the majority of performances, even if a soprano didn’t handle well the demanding parts of the score in the first 3/4 of the opera, things will often come together for the closing scene: the lyrical writing practically sings itself, and the emotional impact nearly always comes through). The long-set precedent of Norma’s being of an unattainable nature were the number of sopranos with lousy florid techniques and wrong voices who sang—or rather, massacred it. In Lanfranco Rasponi’s The Last Prima Donnas, several of the subjects proudly lay claim to their Norma. It was to them a mainstay of the dramatic soprano repertory. Many of the documents left behind by these sopranos are, frankly, awful, often grotesque in the worst way. Fruity, gunned vibratos, a bumpy, clumsily articulated line, caterwauling, sloppy coloratura, carelessness of note-values, and a veristic approach were the order of the period. There are a few nuggets here and there who demonstrated a Bellinian line—Lilli Lehmann and Adelina Patti, though both aged, give an indication in their accounts of Casta diva of how such music was once handled. Rosa Raisa, Rosa Ponselle, and Zinka Milanov (in the mid-40s), all dramatics, judging by documents, fared better than most in delegating a fluid smoothness of approach. But Ponselle had to transpose a third of Norma’s music, ditto, though less so, for Milanov. Tomorrow, we focus in detail on Gruberova’s druidess!